It is finally here. The greatest wildlife migration in North America has started. 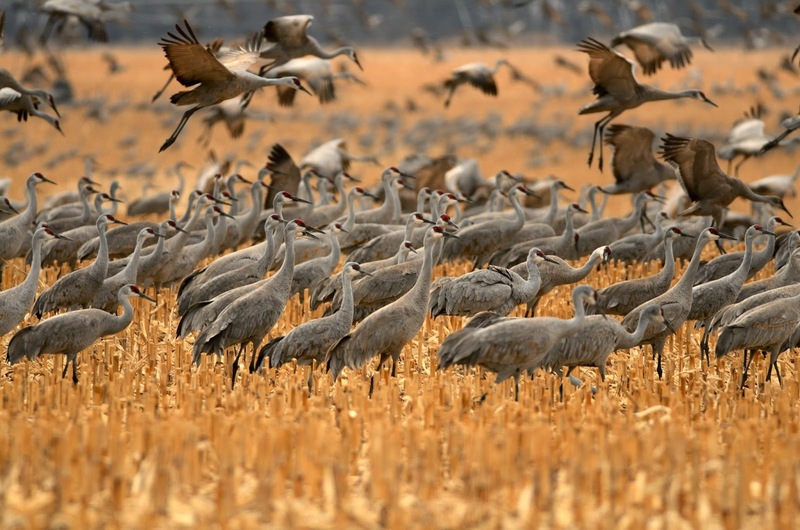 Upwards of 500,000 Sandhill cranes will make their way to the Platte River for about 4 weeks. They are going to eat and attract a mate. If they already have a mate they are going to eat. On a last second decision I made my way from Omaha to Grand Island to see what I could find. The winds started out from the south and it was in the 30's. By the time I left the winds were from the north and it was 10 degrees. During the day the cranes eat in the fields around the Platte River between Kearney and Grand Island. There are lots of dirt roads to drive on. Be careful and courteous of the farmers working their fields. Their vehicles are much bigger so playing chicken with them is not advised. If you go - you are going to do most of your viewing from the car. The cranes don't like humans. They are hunted everywhere except NE. A great place to stop is at the Rowe Sanctuary. My friends there are great. They care for the river and love sharing this special place. Now is the time. Most of the birds will be coming in the next 2 weeks and will be gone by the 2nd week in April.